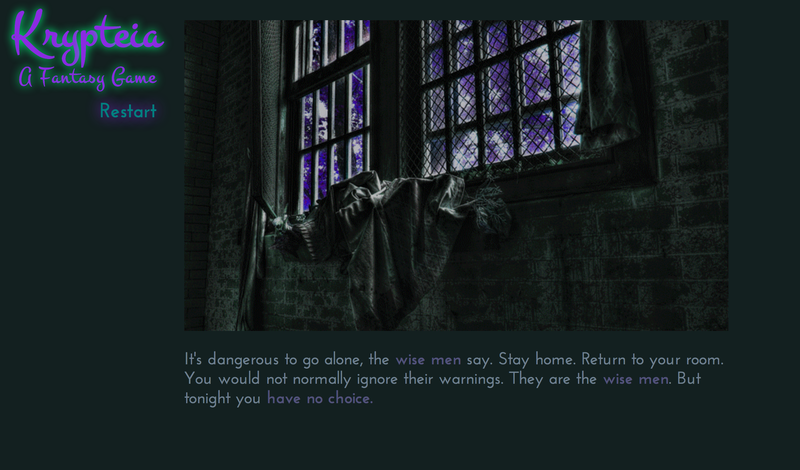 Krypteia is a multimedia game with both images and sound as an essential part of the experience. Though it is choice-based, it offers a map, inventory, and light puzzles. It is partly fantasy, but it is also about identity, community and the enforcement of community norms, the choice between being openly oneself and being safe. It took me on the order of 15 minutes to play once, and I then played a couple more times to reach alternate endings. First impressions: nice cover art. Classical reference in the title and implicitly in the blurb. General sense of spookiness. Author is someone I’ve met (though briefly) at an IF event and chatted with other times on Twitter. I feel good about this. Which, it turned out, was the right call. Krypteia refers to a Spartan practice that isn’t really very well understood. (The word means “hidden things”, which may explain why detailed descriptions are not forthcoming.) It was possibly a rite of passage for young soldiers, in which they lived alone off the land, sent away from their community before being reintegrated into it in a new and more responsible role. It was possibly a time when they were encouraged to attack the helots, the essentially slave population which provided most of Sparta’s agricultural labor, without repercussion. So far as we understand it at all, Spartan krypteia had some parallels with the Athenian ephebeia, the practice of sending young men out to patrol the borders of Attica, where they were considered to be in the domain of Dionysus Melanaigis. Dionysus was also the god of drunkenness and abandon and the pulsing drum, of maenads running through the woods, of the animalistic impulse unleashed, of pure uninhibited existence. In some of his roles Dionysus appears with flowing robes and beautiful hair, girlish and slim, but nonetheless astonishingly strong. At other times he is mature, bearded, wearing a leopard skin, a token of his wild hunt. He blurs masculinity; he frees women from the households that (in Athens, at least) are expected to contain and silence them. He is an outsider god, said to have come from the decadent east. And he is superbly dangerous, punishing with madness or death those who do not recognize his divinity. When the uptight young ruler Pentheus denies Dionysus, his own mother, in holy ecstasy, tears his head off with her bare hands. This background is not needed to understand Krypteia the game, but knowing about it provides some additional depth to what is already a multilayered story. Krypteia on the surface tells about a young person, probably on the verge of adulthood, who leaves the safety of a village confined by elders to venture into the heart of the woods, and who has an experience with monsters there that leaves them permanently transformed. At the same time, it indicates — through the shifting pictures that switch back and forth between forest scenes and urban streets, through changing phrases in descriptions, through the mix of historic and modern objects that the protagonist finds to use and wear — that this is also a story about the present day and about the establishment of a queer identity, and about the aggressive means used by “the wise men” to police behavior. There are various IF games built around the idea that what is “really” happening is different from what’s narrated to the player — Bliss is a standard reference point, though The Baron does something similar much more effectively — but many of these operate on the principle that the protagonist is delusional or at best concealing the truth from himself. In Krypteia, the two layers work in tension, rather than one supplanting the other: the village fantasy tale and the urban queer adolescence are simultaneously true, with the fantasy representing the internal character development and thus being in a sense dominant even if it is also the metaphorical layer. and horns grow on your head. But were you always a beast? It really looks as though you’ve… bull-ified. but is now in a truce with us. Now you see what you ought to see. Or, depending on how you choose to translate: Now you see what is necessary for you to see. Now you see what you have to see. It’s ambiguous where the necessity comes from. It could mean “what you ought to see [because it’s true]” or “what you ought to see [because that’s what best allows me to manipulate you]”. Showing both the literal and the figurative simultaneously, and keeping their relationship ambiguous, is what Krypteia does with its image overlays. And then — but I think I’d better spoiler tag now. As the story unfolds, the protagonist has the opportunity to embrace one of two strategies: self-concealment that promises safety but becomes self-erasure, or else a beautiful, deadly self-expression. In a hoodie and sneakers, they can go unnoticed, and the font that describes their experience becomes thin, formal, blue, impersonal, fading against the dark background of the screen. In sparkling stilettos and a big crystal necklace, they think in hot pink handwriting, glorying in their beauty and power. What with the cave and the leopard skin and the protagonist’s alarming habit of indulging of sparagmos, together with the fact that the pinker self is supported by a stat labelled “Wolf”, I read this as a Dionysian transformation via lycanthropy. Meanwhile, I understood the monsters kept by the old men as being the other adolescents, the ones who have been allowed to participate in the rites from which the protagonist has been excluded. They hunt the forest (like the Spartan Krypteia participants) and enforce norms by making it too dangerous for anyone to step beyond the village; or alternatively, simultaneously, in the urban landscape they are vicious transphobic bullies who brutalize anyone who fails to conform to gender norms. Those in power use the weak against one another in order to preserve their own position. Krypteia captures the special appeal of the Dionysian: the idea of being more truly and completely oneself by stepping out of one’s inhibitions, setting aside the limiting factors, being at one with your physicality and unafraid of yourself. 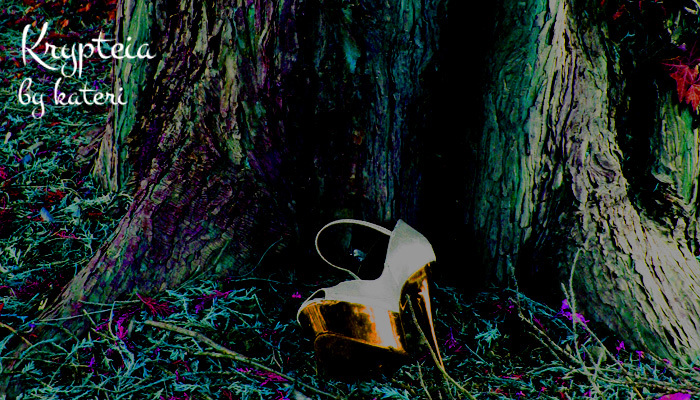 The protagonist feels more like themselves when they find and wear the sparkling stilettos. They smile “with every one of [their] teeth”. I found this so appealingly narrated, and I so wanted the protagonist to get to be themself and to claim back some power, that even in spite of pretty clear warning signs I was a bit taken aback that going full-on GlitterWolf turned out to be so bloody. But as seen in another recent piece of IF, a full surrender to Dionysus is not safe. The morning after, you tend to find entrails draped on the trees. Ultimately, the protagonist has various options — to fade from being, to become something a bit godlike but also a bit monstrous, to seek a fragile self-knowledge earned in this sojourn in the woods. Even the best of these outcomes (in my view) is only tentatively hopeful. Ahhh, Emily — I rarely play IF these days, but read your reviews faithfully — they’re a free-standing pleasure. Them – the monsters? I suppose this is a typo. No; I was using “them” as a gender neutral pronoun for the protagonist, because I didn’t think it was completely clear from the game whether that protagonist would prefer “he”, “she”, “ze”, or something else. The shadow text, for me, was completely unreadable even when highlighted. Did other people find the same thing or is it just my particular combination of monitor and browser?